I recently listened to a Stuff You Should Know podcast about whether objects or experiences make us happier. It was pretty conclusive that experiences win almost all the time. So, with Mother's Day just around a day away, if you haven't found a gift for your mama yet, don't fret. Craftsy is having a mondo sale this weekend. Why don't you buy a new experience for you mom instead of another scented candle. 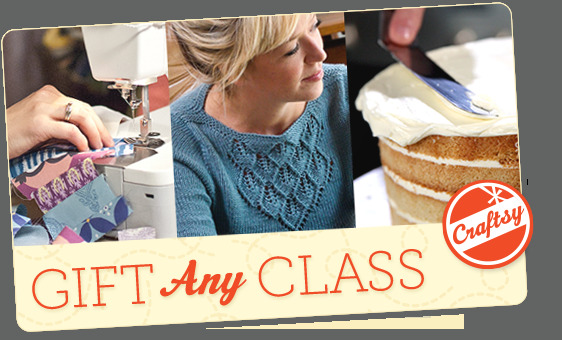 Craftsy has a wide variety of classes that you can take at your own pace. Once you purchase a class, you have access to it forever so you never have to worry about it expiring or getting locked out. There's a ton of topics available too at various skill levels. Whether your mom wants to learn cake decorating, knitting, quilting, or maybe something totally different, there's a Craftsy class to help her learn. And this weekend, select classes are $20.00 making many classes super affordable- $25 or less. I've taken several classes from Craftsy in the past, and have always been very happy with the results, I'm sure you mom will be too. I am a Craftsy Affiliate, but only recommend companies I believe have true value. All opinions are my own.